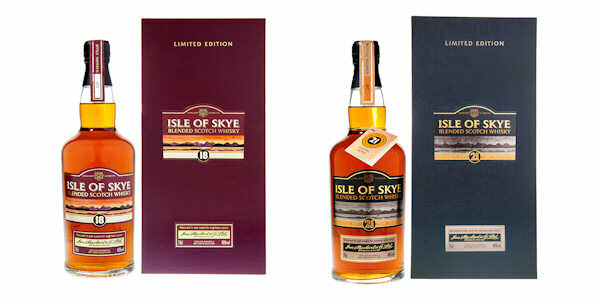 To toast the start of Scotland’s Year of Food and Drink, Isle of Skye Blended Scotch Whisky is pleased to announce the launch of two new limited edition blended Scotch whiskies, an 18 and 21 Year Old. Isle of Skye Blended Scotch Whisky has introduced the additional expressions as an extension to the range that currently features the popular 8yo blend, described by Jim Murray as a ‘superstar whisky that gives us all reason to live’. A fruity and well-balanced 12yo and a limited edition, elegant 50yo, of which only 400 bottles were ever produced, complete the selection. The new 18yo has an enticing coastal air with gooseberry, cinnamon bread and gentle peat on the nose with a light smoke and fresh fruitiness on the palate and a malt and dark chocolate finish. The 21yo has a nutty, dried banana and brown sugar nose with a rich full body on the palate, honeyed porridge and tropical fruit. The finish is wonderfully long and of dry rich oak. The RRP for the 18 and 21yo are £85.00 and £125.00 respectively. Both are available from Harrods and the Isle of Skye Blended Scotch Whisky online shop.